Cosplay Interview with Jen Yates of EPBOT « Adafruit Industries – Makers, hackers, artists, designers and engineers! Jen Yates of Epbot has been impressing me with her how-tos and crafty skills for a couple of years. She not only comes up with creative ways to approach cosplay, she makes it look simple. 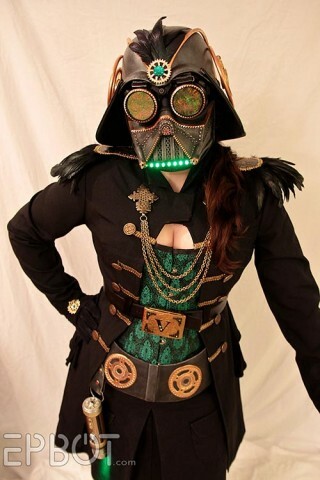 Jen is especially skilled when it comes to designing steampunk apparel and accessories. Her detailed tutorials always make me sit back and think, hey, I can do that too – or at least I can try. Her encouraging nature is the kind of attitude that inspires others to dive into cosplay and see what happens. She was kind enough to spend time answering some of our questions about her cosplay history. Adafruit: How long have you been cosplaying and what inspired you to start? 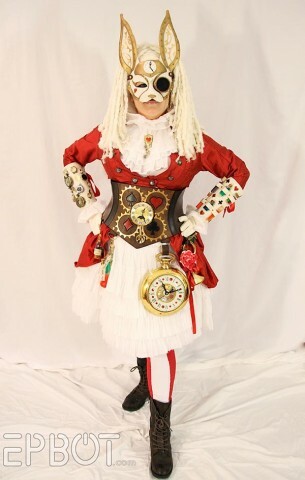 Jen: My first non-Halloween costume was in late 2011, when I wore a cobbled-together steampunk outfit to Dragon Con. The next year I got serious with Lady Vadore, though, which I consider my first “real” cosplay. 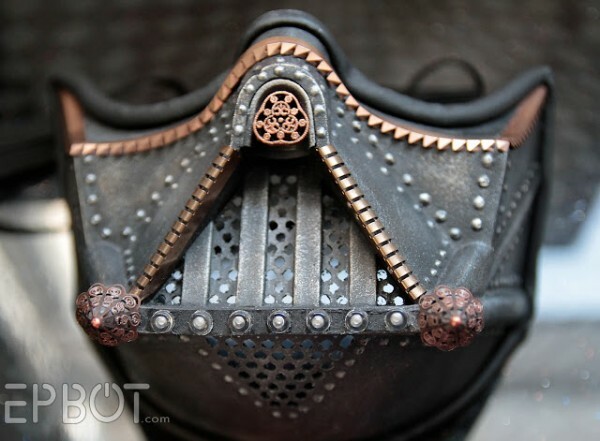 I was inspired by steampunk, of course, but also by the challenge of re-inventing a familiar character (Darth Vader). Adafruit: Now that you’ve been doing it for a few years, what’s the most rewarding part about cosplaying? Jen: I actually enjoy the process the most: brainstorming, problem-solving, tinkering with common objects to see how you might re-purpose them – that’s the stuff i really relish. Of course seeing it all come together in the end can’t be beat, either, and watching other fans see it for the first time? Well, that’s a million cherries on top. Adafruit: What’s the coolest technique you’ve learned along the way? Jen: I’m still learning, but for the most “wow” factor I love the things you can do with dry-brushing and metallic waxes. You can make anything – anything! – look like weathered metal, and for very little cost. I’m in awe of the cosplayers out there who use just craft foam & paint to make these AMAZING full suits of armor. Adafruit: Tell me about one of your most frustrating cosplay challenges and how you did or didn’t overcome it. Jen: I’ve only done two complex cosplays, but both designs changed a LOT over the process. One huge challenge was fitting the green LEDs into my Vader mask, since neither John (my husband) nor I knew much about electronics. We managed to get the first light strip glued and wired into the mask… but then two of the LEDs went out! We later learned the lights only functioned in sets of 3, so we had to rip the whole thing out and start over with two extra lights added. Arg! That meant cutting the mask tusks to make room, so next I had to make new metal tusks to cover the mess. It was a huge pain, but eventually I got it together. Adafruit: What has been your favorite material you’ve worked with and why? Jen: I like hard materials like plastics or leather, because they stay put and aren’t nearly as temperamental as fabric. And also because I am TERRIBLE at sewing. Ha! Adafruit: Any tips or tricks to offer other cosplayers, especially newbies? Jen: One thing I’ve learned – but I’m still struggling to put into practice – is to think BIG. Don’t get so caught up in smaller details that you neglect the overall silhouette and the parts people will see first. Start with your character’s most essential pieces, and then as you have time you can go back and add in the details and fun fiddly bits. Also remember that everything you make looks ten times better from a few feet away – which is how most people will be seeing it – so don’t get too critical! Some of the best costumes I’ve seen were held on with duct tape and detailed with hot glue – but until you got right up on it, you’d never have known! Be sure to keep up with Jen’s latest costumes and crafts over at Epbot.